Enter the Hawaiian Tropical Splash Getaway from Purex and Outrigger Hotels and Resorts for a chance to win a vacation to Hawaii for free! The winner will receive an Outrigger Reef – Hotel on the beach for 4 days and 3 nights and a 2 year supply of Tropical Splash Purex Crystals! And 500 other winners will receive a coupon for a free bottle of Purex Crystals! 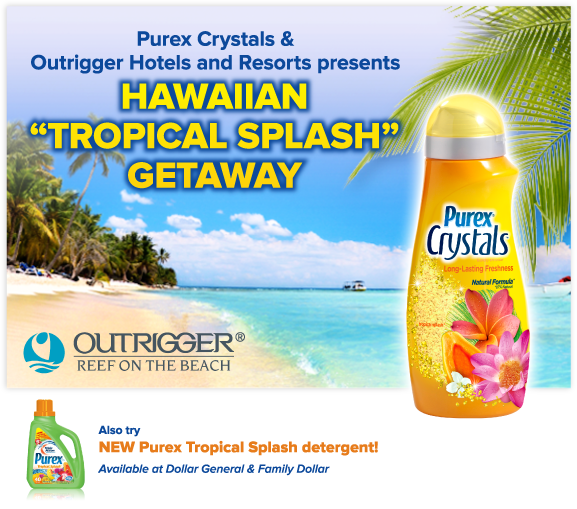 If you want to see more of these promotions like this from Purex, “Like” Outrigger Reef on the Beach’s Facebook page. And let them know that Saving Cent by Cent sent you.